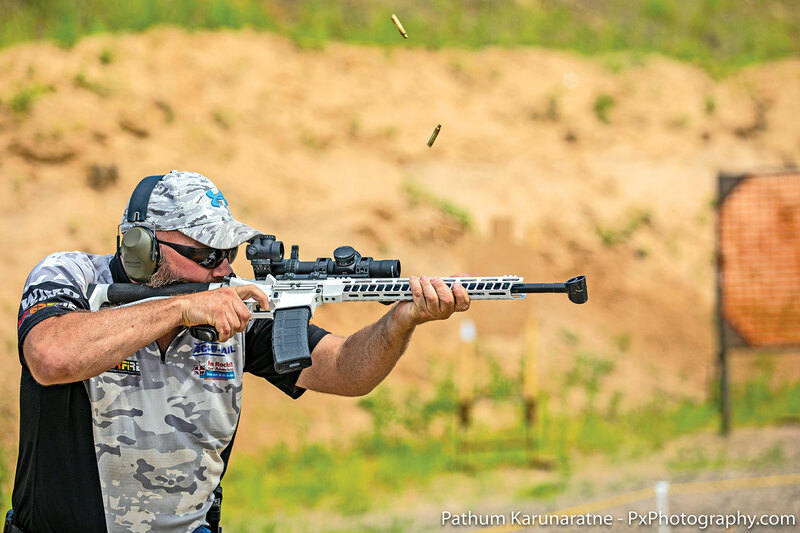 Matt Koopikka competing in USPSA’s Tactical Optics division using a Trijicon Accupower 1-8X scope dialed to 1X. The number of rifle scopes either marketed toward 3-gun shooters or suitable for 3-gun competition has never been greater. In fact, they seem to be one of the “hot” market segments. When I talk about “3-gun scopes,” I’m specifically referencing variable-power scopes with a low-end magnification at or near 1X. 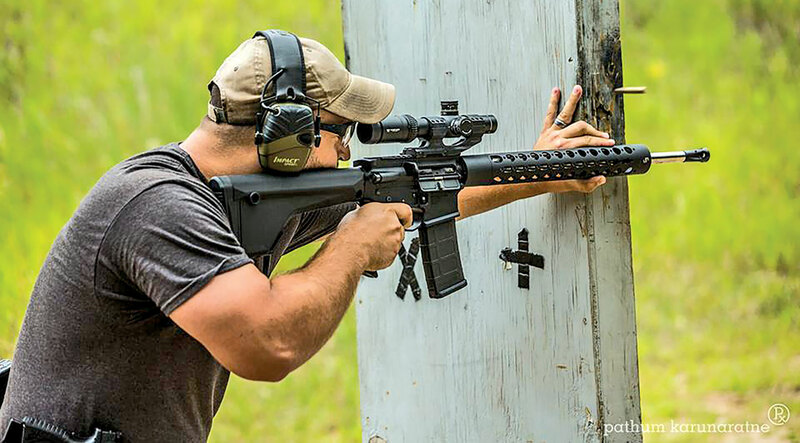 The market is awash with 1-4X, 1-6X, and 1-8X scopes, in part because not only are these scopes suitable for 3-gun competition, they also are an excellent choice for tactical/defensive use. Some are marketed directly toward 3-gunners, others have just been adopted for that purpose. There are actually now so many companies making scopes suitable for 3-gun competition that it is not possible for me to cover even all the companies, much less the products that they make in one article, so this piece will endeavor to just hit the high points, covering the most popular brands, their most popular scopes, and the most popular reticle options, plus the trends that have occurred over the years. Pro shooter Taran Butler running a 1-4X Trijicon TR24 at the USPSA Multi-Gun National Championships. Photo Courtesy USPSA. What The Heck Is 3-Gun? First, a quick primer on what 3-gun competition is, and what kind of rifle scope you’d want for it. The three guns in 3-gun competition are pistol, rifle, and shotgun. A 3-gun competition features fast-moving practical or combat-style shooting at a wide range of targets, everything from cardboard silhouettes to falling/moving steel targets to nontraditional targets, such as bowling pins. 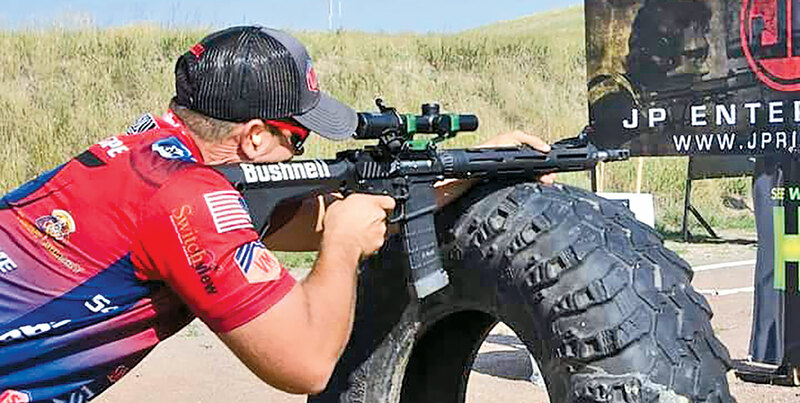 While the popularity of 3-gun matches is perhaps on the wane (due to the stupidity of the “reloading contest” shotgun portion), in many places around the country you’ll see “2-gun” matches popping up (pistol and rifle) to replace the standard 3-gun. When it comes to the shooting sports, a 3-gun match is the closest you’ll ever come to starring in your own action movie. Rifle target distances range from point blank out to the limits of the available space, and the shooter is always on the clock, so the faster you can hit the targets, the more likely you’re going to win. When I say point-blank range, I mean it. Most rifle targets you won’t see closer than three yards, just because any closer than that and the muzzle blast blows target pasters off and/or holes in the cardboard targets, but rifle targets at handgun distances are common. You’ll also see targets at 100, 200, or beyond 300 yards, sometimes on the same stage with the arms-length ones, which is why shooters favor variable-power optics. They can handle anything the stage designer/rangemaster is liable to throw at you. Because of this range and flexibility, these types of scopes are currently hugely popular with the tactical crowd as well. 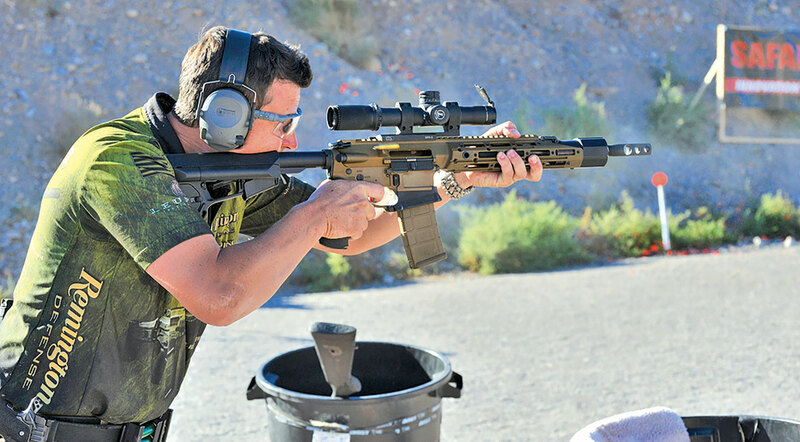 There are several divisions in 3-gun competition that dictate which equipment you can use. 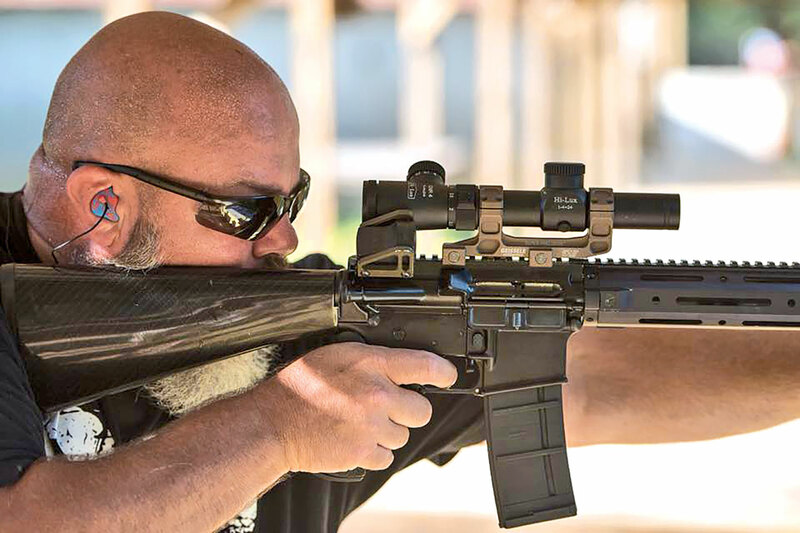 Between 3-Gun Nation and USPSA rules, the terminology might be a bit different, but in Tactical Optics division, you are allowed only one optic on your rifle, so this is where the variable-power scope shines. In Open Division, you are allowed more than one optic, and most competitors run a variable power up top turned to the highest power they think they’ll need for a stage, and a have a small red dot offset at a 45-degree angle for hammering those close-range targets. 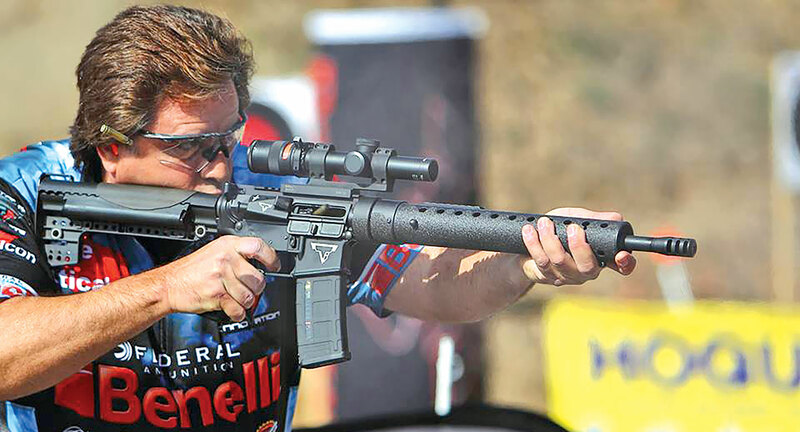 The criteria by which 3-gun competitors choose their scopes is very different from hunters or long-range shooters. With 3-gunners, they’re mostly looking at brand (as there is always brand loyalty), price, reticle, and the magnification range. After those factors, smaller factors come into play, such as whether or not the scope has an extended throw lever for quickly changing magnification, how and/or whether the reticle is illuminated, and weight. I’ll divide coverage by brand. Fifteen years ago, variable power scopes with a low end at or near 1X were not nearly as common as they are today. The Trijicon (www.trijicon.com) TR21 AccuPoint scope was very popular among 3-gunners, in spite of the fact that the low end of magnification was not a true 1X, but rather 1.25X. A lot of people, including professional shooter Taran Butler (who was and is sponsored by Trijicon), begged Trijicon to make a scope with a true 1X low end, and roughly a decade ago, it obliged with the TR24, which has supplanted the TR21. The TR24 1-4X is a true 1X at the low end. It followed that up about five years ago with the TR25, which is a 1-6X scope. These scopes have 30mm tubes, and when it gets too dark for the fiber-optic illumination to work, the reticles are illuminated by tritium. 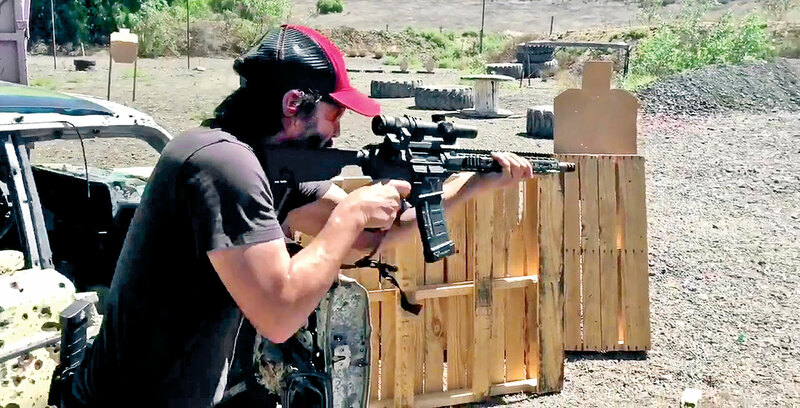 Keanu Reeves running a Trijicon TR24 atop a TTI competition rifle (with an RMR at a 45-degree offset) while doing live-fire training under pro 3-gun shooter Taran Butler for John Wick 2. One of the reasons the Trijicon AccuPoint scopes have been very popular with 3-gunners is their fiber-optic illumination, which makes the reticle as bright as a battery-powered dot, even on a cloudy day. A second is their extended eye relief, which is more forgiving when shooting at 1X with two eyes open at multiple close-range targets. Another reason is their unique “Triangle Post” reticle, although they do offer traditional illuminated crosshairs. This is a big (16.7 MOA at 1X/2.8 MOA at 6X) fiber optic-illuminated triangle (red, green, or amber), which sits on top of a post, the center of which you can see through. These are rear/second focal plane scopes, so the triangles always stay the same relative size to your eye, no matter the magnification. At 1X or so, this reticle can be used with two eyes open like it’s a red dot. At distance, you use the point of the triangle for aiming, and it is surprisingly precise. However, this reticle is despised by many traditional rifle shooters and has been the source of many arguments between myself and fellow Firearms News writer David Fortier. 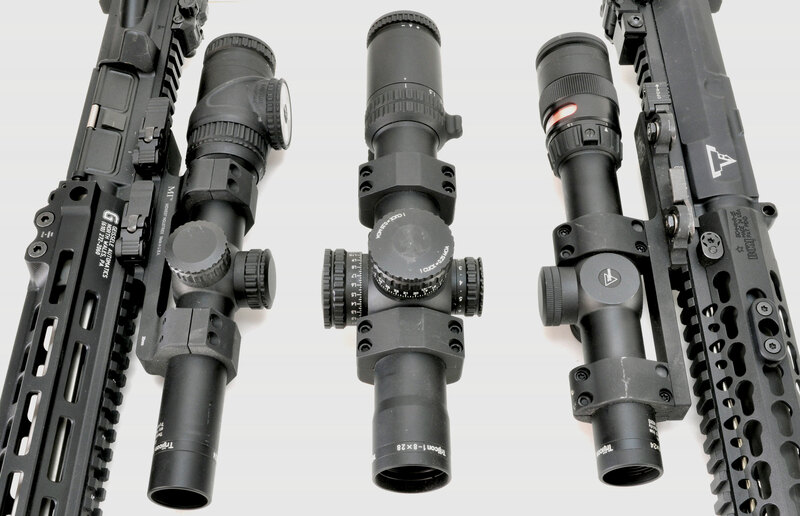 Three Trijicon scopes. The 1-6X TR25 AccuPoint on the left, the 1-4X TR24 Accupoint on the right, with the 1-8X AccuPower in the center. Dave hates this reticle because it at least partially blocks your view of the target if you have to shoot with any holdover, and there are no BDC/elevation marks on the post. I understand that, but Dave made his bones shooting High Power matches and lives on his own 800-yard range. It is a rare 3-gun match where you need to worry about holdover (see the sidebar on PRS vs 3-Gun). I have a TR25 1-6X with Triangle Post reticle on one of my tactical/defensive rifles, because I live in the suburbs and even if the zombie apocalypse happens today, I won’t have a shot beyond 200 yards, and as the reticle is illuminated by fiber optics, there are no batteries to die. I love, love, love this scope, which has an MSRP of $1,399. Trijicon also has its AccuPower line of scopes, which feature reticles illuminated via batteries. It offers a 1-4X and a 1-8X. I’ve had a 1-8X on hand for a while and really like it. This scope features a 34mm tube, segmented circle reticle with (MOA or Mil Dot) crosshair, and you have your choice of red or green illumination for the segmented circle. This is a front/first focal plane (FFP) reticle, which means you zoom into the reticle as you increase magnification. Suggested retail on this scope is $1,699. Leupold (www.leupold.com) is one of the biggest names in scopes in this country, but it has only recently deliberately marketed its scopes toward 3-gun competition. While many people have used Leupold scopes in 3-gun, many have not, because traditionally its low-power magnification scopes started at 1.25X or 1.5X. You might not think there is a big difference between a 1X and 1.5X low end, but when trying to run your scope like a red dot on multiple targets at cherry pit-spitting distance, you do not want any magnification at all. Tarr running a Leupold 12.5-4X VX-R Patrol atop a Stag Arms 3Gun competition rifle. The FireDot reticle works well enough for competition, but a 1X low end works better for two-eyes-open close-range shooting. You have your choice of several 1.5-4X VX-Freedom scopes meant for ARs, most with traditional duplex reticles, but they start at an amazingly low $259. Some shooters have run Leupold VX-R 1.25-4X scopes with their illuminated FireDot reticles meant for hog hunting, and they work reasonably well. They start around $600. Leupold sells a version of this aimed at the law-enforcement market called the VX-R Patrol. Leupold now has its VX-5 (1-5X) and VX-6 (1-6X) lines, but it promotes these for big-game hunting, not competition. Still, when equipped with its FireDot reticles, they work very well and have retail prices starting around $900, and, as Leupold is perhaps the biggest American-made scope company, you will see a lot of its scopes at matches. Leupold recently introduced its budget-priced ($389 and up) line of Mark AR scopes, which includes a 1.5-4X, but it really only has a few products it specifically and aggressively markets to competition and tactical shooters….and you should be prepared to fork over some serious $$$ for them. 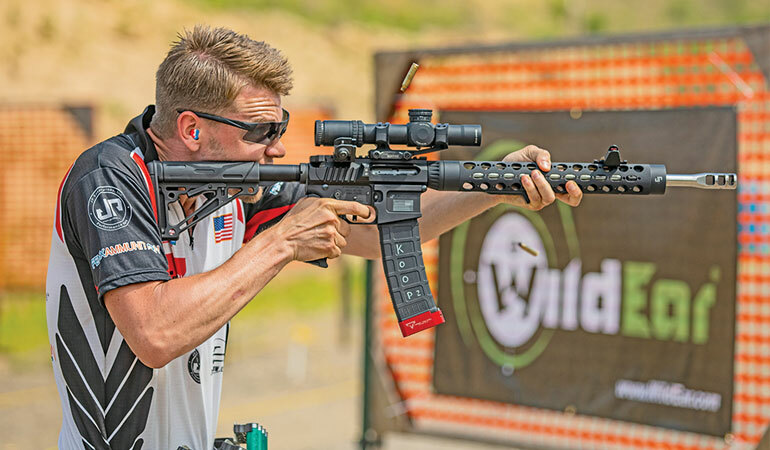 Sponsored Remington shooter Robbie Johnson running the very pricey Leupold 1.1-8X CQBSS scope at the USPSA Multi-Gun Championship. Photo courtesy USPSA. The first is the front focal plane Mark 6 1-6X with its CMR illuminated reticle and 34mm tube. This scope runs $2,859 and is excellent, but it had better be for that price. Last, but far from least, is perhaps Leupold’s most famous variable-power tactical scope, introduced circa 2010, the CQBSS 1.1-8X. This is a FFP scope with 34mm tube and special illuminated reticle. When it was introduced, the CQBSS was priced so high, only the independently wealthy and fully accredited military spec-ops space-ninja types, armed with fistfuls your tax dollars, could afford it. Prices were far north of $5,000. Don’t get me wrong, this is a fabulous scope, and at the time it was introduced, one of the few 1-8X scopes on the market. It has a number of great features, excellent glass and a very nice reticle, and while the price has dropped significantly (currently $3899), it still might be the priciest 3-gun-suitable scope on the market. Remember my comment above, where I referenced “fully accredited military spec-ops space-ninja types, armed with fistfuls your tax dollars”? When money is no object, you buy the best on the market, and for a number of years, the tactical/3-gun scope to beat was the Schmidt & Bender Short Dot (www.schmidtundbender.de). According to Delta Force veteran Larry Vickers, the original 1.1-4X Short Dot was made by S&B specifically at the request of spec-ops troops needing a variable-power scope that could help identify bad guys in crowds of civilians at a distance, while also being used in CQB scenarios. There are now a number of versions of the Short Dot, from a 1.1-4X to a 1-8X. They feature circle/dot reticles, and the red center dot is illuminated. They have amazing glass and great quality. Prices online start at $2,400 and go up from there. While it was specifically designed as a tactical scope, many people consider the Short Dot the 3-gun scope against which all others should be judged. 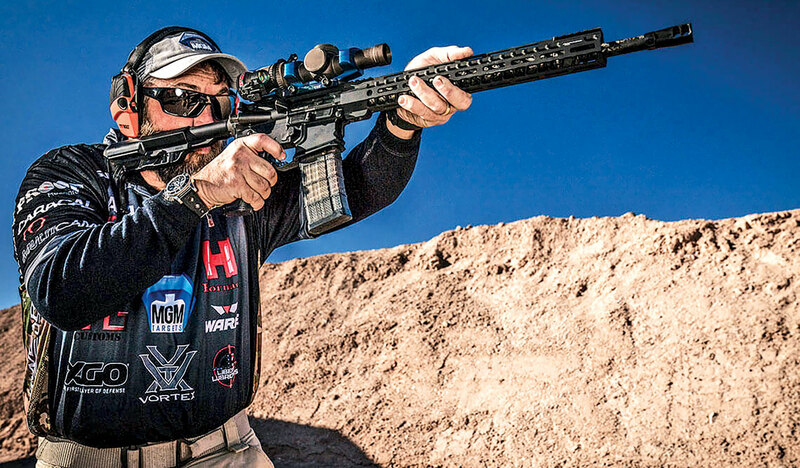 Compared to some of its competitors, Vortex Optics (www.vortexoptics.com) is the new kid on the block, practically still in its infancy, but Vortex scopes are some of the most favored in 3-gun competition. The scopes have rightfully earned a solid reputation, and Vortex has embraced the practical-rifle shooting crowd. I spoke with Mark Boardman of Vortex, as I wondered which of its scopes was the most popular with the 3-gunners, and he told me that its customers were pretty evenly split among the “good, better, and best” scope lines. Best: The Razor HD Gen II-E is Vortex’s top-of-the-line tactical scope. This is a 1-6X offering with a 30mm tube, low capped turrets, long eye relief (4 inches) and a new lighter weight (21.5 ounces). It is offered in several different finishes and with several different reticles. Boardman told me the JM-1 reticle, designed with input from pro shooter Jerry Miculek, is currently their most popular. It features quick-to-use BDC hashmarks out to 600 yards. Current MSRP on the Viper 1-6X is $1,999. Better: The Viper PST Gen II is a 1-6X 30mm scope available with MOA or MRAD versions of its VMR reticle, which is a somewhat traditional illuminated duplex reticle with hashmarks for holdover and windage. The Viper PST Gen II has a suggested retail of $999. 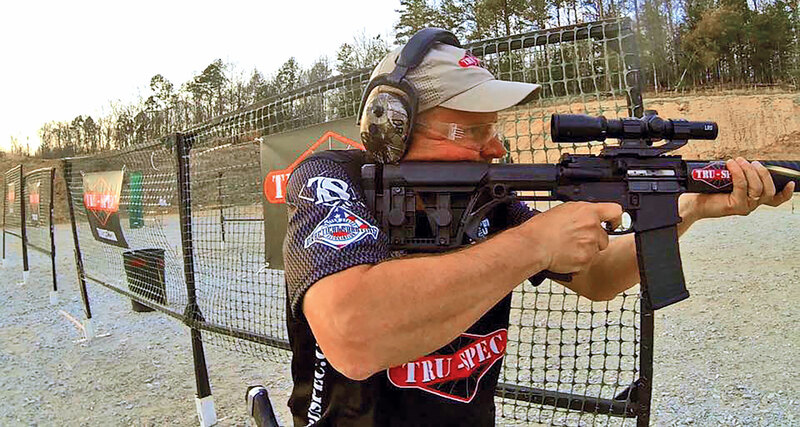 Pro shooter Travis Gibson of MGM Targets running a Vortex Razor HD atop his rifle. Good: Ironically, Vortex’s budget-priced Strike Eagle scope is the one which offers my favorite style of tactical reticle, the upside-down horseshoe I believe first invented by Ed Verdugo. The version in the Strike Eagle has 11 illumination settings and it works great at CQB range or at distance. 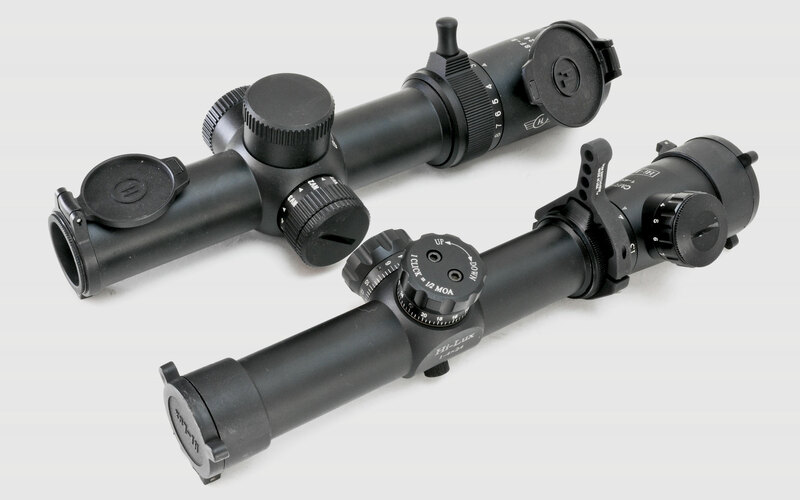 This scope is offered in a 1-6X or a 1-8X, with the MSRPs respectively set at an impressive $399 or $499. SIG Sauer seems determined to take over every related category in the firearms world, from ammunition to suppressors to electro-optics. And they’ve seen huge success, especially in the past year. 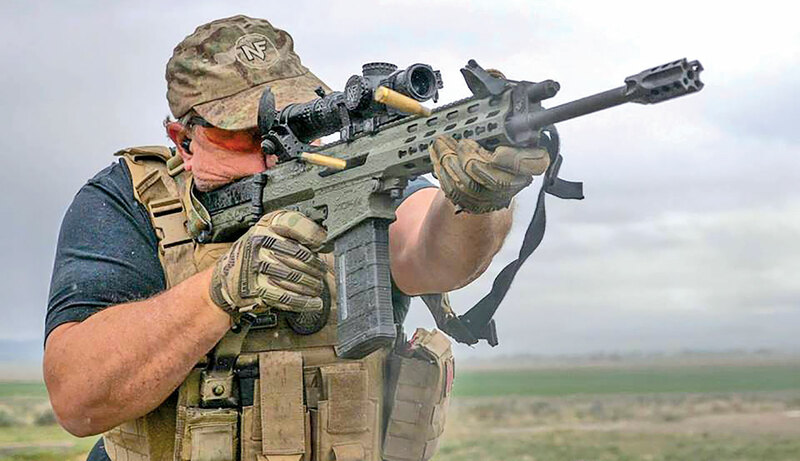 First, its P320 handgun was chosen for a military sidearm, and now a version of its Tango 6 1-6X scope has been selected by the U.S. Army as their new Squad Designated Marksman Rifle optic. These will (at least in part) replace the 4X Trijicon ACOG scopes, which have been in service for close to two decades. A fixed 4X is a good magnification for a general-purpose scope, however it can be a bit lacking at distance, and nearly useless up close—why do you think people started mounting mini red dots on ACOGs? A scope that can dial from 1-6X can be used for room clearing, while also allowing soldiers to identify and engage targets out to the effective range of the 5.56 cartridge. 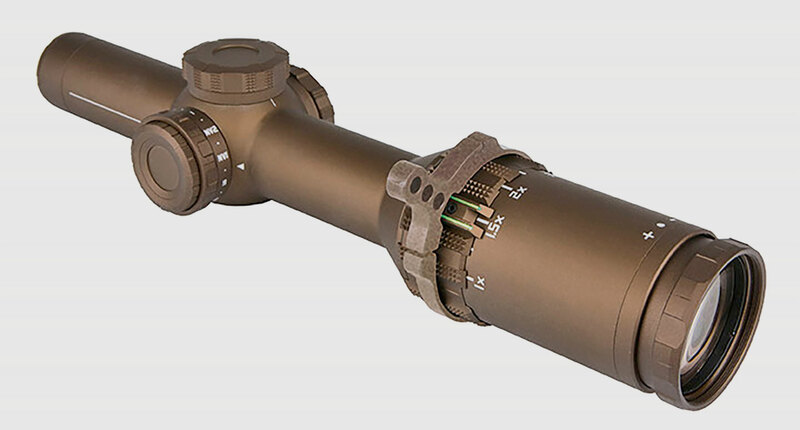 Variable power optics with a 1X low end are so “in,” the U.S. Army has adopted this, a variant of the SIG Tango 6 1-6X optic, for their DMR program. The main differences between the U.S. Army’s Tango 6 and the commercial variant are the color (tan instead of the commercial black or graphite gray) and the reticle, which in the military version has a BDC corresponding to M80A1 ammunition. A commercial version of the variant adopted by the military will be released, but don’t look for it until fall 2019. There are honestly a dozen different commercial variants of this scope, both first and second focal plane, with four available illuminated reticle options. They are built with 30mm tubes, and you have your choice of capped or tall turrets. Prices start at $1,679. Daniel Horner, who has quite a few national 3-gun titles under his belt, uses this scope. I’ve long been a proponent of Hi-Lux scopes (www.hi-luxoptics.com). These scopes are made in China, which keeps the price down, but don’t think that affects the quality—your iPhone is made in China as well. Hi-Lux has two CMR (Close/Medium Range) scope lines, which are great for 3-gun competition, the 1-4X CMR4, and the newer 1-8X CMR8. The CMR4 is available in several variations—there are BDCs for 5.56 ammo or 7.62x39, and testing has shown that a BDC that works with the 7.62x39 also works with supersonic 300 Blackout ammo out to at least 400 yards. The reticle is illuminated (green or red), the 30mm scope comes with flip-up lens covers, and prices start at just $330. The CMR8 is a newer offering from Hi-Lux. This is a first focal plane scope with a detailed illuminated horseshoe/BDC reticle that works as well at 1X as it does at 8X. The scope has a 34mm tube, comes with flip-up lens covers and an extended throw lever to change magnification, and you have your choice of MOA or MRAD reticles—all for an MSRP of $749. Two Hi-Lux scopes. The 1-8X CMR8 is on the left, the 1-4X CMR4 on the right. The CMR8 comes with an extended throw lever, the CMR4 on the right wears an MGM Switchview extended lever. Discerning scope buyers will note that the glass in the Hi-Lux scopes (and many other mid-price scopes mentioned in this article) is not as good as found in some of the pricier scopes on the market. High-end glass is great for performance in low light, which is often critical when you need those extra three minutes of visibility at dusk to spot animals while hunting, but you pay through the nose for it. 3-gun matches are not held in low light. If there is one thing competitive shooters are known for, it’s being tight with a dollar, and not wanting to pay money for something they don’t think they need. Personally, I rarely hunt, and my eyes aren’t that great to begin with, so the difference between “good” and “great” glass is wasted on me, and I prefer not to pay for something that I can’t make use of. The vaunted Nikon (www.nikonsportoptics.com) has two lines of riflescopes with products suitable for the 3-gun game, its Black line and its AR line. 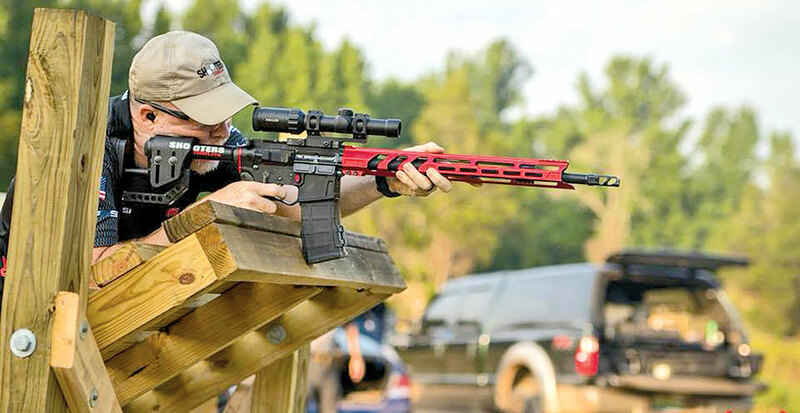 There are so many scopes either suitable for or marketed toward 3-gun competition that it’s hard to keep track of the manufacturers, much less the models. Here are two inexpensive models—in front, the 1-4X Nikon Black Force 1000, and in back the 1-6X TruGlo Omnia 6. The Black line features products of a more tactical bent, and Nikon’s Black Force 1000 is a 1-4X meant for ARs that works great for 3-gunning. Sporting a 30mm tube and Nikon’s double-horseshoe glass-etched “Speedforce” reticle, this is a front focal plane scope with 10 illumination settings. While I think “Black Force 1000” sounds like some sort of cheesy 1970s blaxploitation film that might feature a lot of bad kung fu, with a suggested retail of only $399, this scope is a great deal. Nikon’s AR line of riflescopes are meant to—you guessed it—top AR-style rifles. Under that umbrella is its new M-Tactical 1-4X budget-priced scope. This scope features Nikon’s MK1 MOA BDC reticle, which is more of a traditional duplex. This reticle is not illuminated, but because of that, this scope has an amazing price—just $249.95 MSRP. 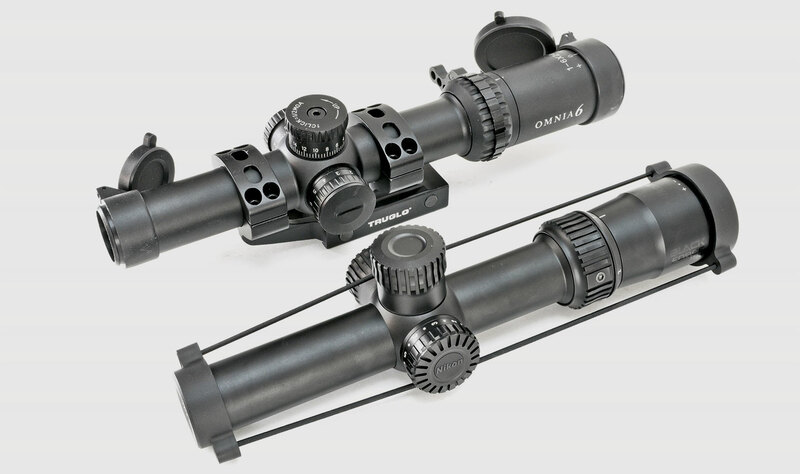 Burris (www.burrisoptics.com) has one of the most extensive lists of scopes suitable for 3-gunning of any manufacturer. It has its Fullfield TAC30 1-4X, its XTR II 1-5X, 1.5-8X, and 1-8X, its MTAC 1-4X, and its new RT-6 1-6X. All of these scopes feature 30mm tubes and various proprietary (and excellent) illuminated reticles, and are covered by Burris’ Forever Warranty. The XTR II line is its most expensive, with prices starting at $959 for the 1-5X, $1,199 for the 1.5-8X model, and $1,439 for the 1-8X model. You have your choice of a front or rear focal plane in the 1-8X. Burris’ MTAC is its budget-priced tactical scope, with prices for this rear focal plane 1-4X starting at just $479. The MTAC features Burris’ Ballistic CQ reticle, which I call the “tactical donut.” It has a huge thick circle for use at close ranges, with a finer BDC reticle inside the donut. Long-range rifle purists seem to hate this reticle, but I love it. It is a reticle equivalent of the EOTech HWS circle/dot. In fact, I’ve owned a Burris MTAC for about 10 years, and it is mounted on the rifle I keep in my bedroom, which should tell you whether or not I trust it. 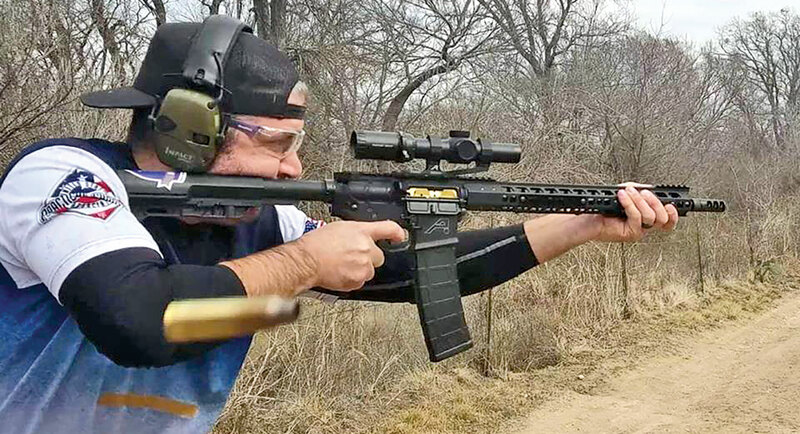 Tarr running his own BCM AR topped with a Burris 1-4X MTAC on Dave Fortier’s personal range. While 4X isn’t ideal for extreme distance, Tarr was able to ring steel out to 800 yards, which is further than you’ll see in any 3-gun match. In fact, it was a Burris MTAC mounted on a BCM rifle that I used when I appeared on exhibition shotgun shooter Patrick Flanigan’s TV show “Shell Shocked” back in 2012, or so, when he wanted to compete against a 3-gun shooter. I was a better rifle and pistol shot, and he destroyed me with his shotgun skills. The RT-6 is one of the newer scopes from Burris, and it was specifically designed for competition and tactical shooting. It is a rear focal plane scope. It has an almost infinitely adjustable extended throw lever to change magnification, sports Burris’ illuminated Ballistic AR reticle, is shorter and lighter than just about every other 1-6X scope on the market, and prices start at just $419. This is one scope to watch. Another company with a number of 3-gun-suitable scopes is Bushnell (www.bushnell.com). In its AR Optics line, it has a 1-4X available with a front or rear focal plane reticle, with its duplex DZ reticle or its illuminated horseshoe BTR-2 reticle. This scope features a rather large extended throw lever, and prices range from $220–$450, depending on the focal plane and the reticle. In its high-end Elite Tactical line, Burris has three solid offerings, with prices ranging from $1,822 to $2,368. The 1-8X SMRS doesn’t have an extended throw lever, is black, and has its excellent illuminated FFP BTR-2 reticle. The 1-6.5X SMRSII is a black rear focal plane scope with a folding throw lever and exposed turrets, using Bushnell’s QC BDC illuminated reticle. The 1-6.5X SMRSII PRO comes in flat dark earth, has a fixed extended throw lever, and is a rear focal plane scope with Bushnell’s QC BDC illuminated reticle. What is “the most popular” 3-gun scope? There isn’t one. There are just too many options. In preparing this article, I reached out to all of my Facebook “Friends” who are fellow competitive shooters and asked for some photos, many of which you’ll see in the article. While Trijicon, Leupold, and Vortex scopes seem to be the most popular, you can find every brand under the sun being used in competition. Again, I just did not have the space to cover all the scopes used by 3-gun competitors or suitable for the game. For example, I didn’t even mention the ELCAN Specter DR 1X/4X scope, which works well for competition, simply because it is rare and somewhat expensive—but I’ve seen shooters using them. Nightforce has both its NX8 (retailing for about $1,800) and its new ATACR ($2800) 1-8X scopes, and they have a rabid fan base. 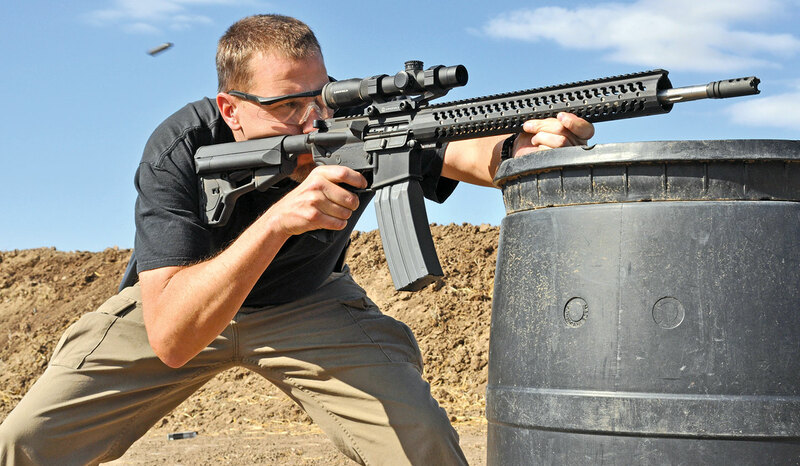 Primary Arms’ Chinese-made optics are favored by a lot of shooters because of their extreme low price, and it offers both 1-6X and 1-8X scopes retailing for under $400. EOTech has its newer 1-6X VUDU FFP scope with a very ingenious double circle-dot illuminated reticle. It wasn’t until I started doing research for this article that I realized just how many variable-power scope options there now are for shooters. Mo’ choices = mo’ betta, as Winston Churchill was fond of saying. Shooters want a scope that has a reticle that functions just as well at 1X as it does at the high end of the magnification range. 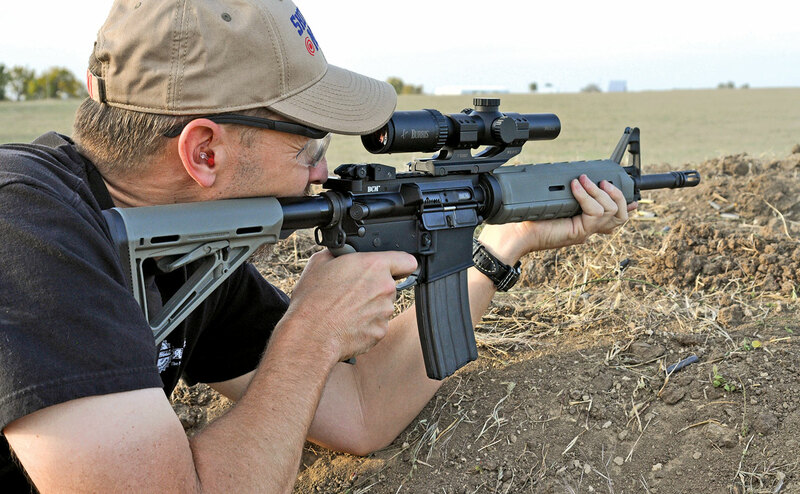 For a number of years, scope manufacturers didn’t get this, and most variable-power scopes had reticles that were excellent when you cranked the scope all the way up to high magnification, but those reticles were near worthless at 1X, at least for high-speed, fast-moving, close-range shooting like you see at 3-gun matches. Not only are there more scope options, there are more reticle options. It used to be you had your choice of 18 styles of black duplex reticle. Not any more. Many companies offer multiple reticle options, sometimes for the same scope, many of them specifically made for 3-gun or tactical use. With many scopes, you have your choice of front or rear focal plane. If you didn’t notice, the scopes marketed toward tactical shooters are the exact same ones marketed toward 3-gun competitors. Even if you never intend to compete in a 3-gun match, the forces driving gear evolution for competition have benefitted everyone.